Frequently Asked Questions about Feeding and Hydration in Elderly during Hospice Care | Ambercity Hospice, Inc. The nature of our business as a provider of hospice care in Central Ave Riverside California can be puzzling to a lot of people because it does not only involve taking care of a person in the final moments of their lives but also because nobody wants to inquire more about death and everything that happens before and after it. Death can be a very sensitive topic but let us all face it; someday, we will eventually come face to face with the Grim Reaper himself. Some may be oblivious to the topic but there are others who are plain curious. Whether it is due to curiosity or just because they do not want to stay indifferent about the matter, people have been asking us questions about feeding and dehydration in elderly especially during their final moments. Can an elderly have a feeding tube while under hospice care? Of course patients with feeding tubes can benefit from hospice care but if you are asking whether or not hospice care includes administering feeding tubes, we do not include that in our services. Usually in our hospice care in Central Ave Riverside California, our patients who are very close to reaching the sunset of their lives may want their feeding tubes removed or it can be done by family members or the patient’s doctors themselves. Can a patient receive IV fluids? Yes. 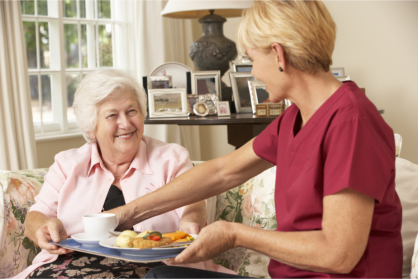 In fact, some providers of hospice care services do administer such service. IV fluids are very useful in stopping dehydration and can keep the patient comfortable. Do caregivers assist with the eating and drinking of the patient? In our own hospice care in Central Ave Riverside California, we do give the assistance our patients need. Our caregivers are not the only ones who will offer such assistance but our physicians, skilled nurses, hospice aides, and other staff members also pour in all their support. The goal in our service is to help provide quality care to our patients. With this as our primary objective, we are willing to do anything so as to assist our clients. This includes their basic needs such as eating and drinking. Are the providers of hospice care allowed to withhold water with request from the patients themselves? Under the law of the land, patients are given the privilege and right to turn down medical treatment. This also includes food and water. If the patient wills it, we at Ambercity Hospice are willing to do it. How long can a patient live without drinking water? Usually when the patient is no longer drinking water, it is a sign that they are near death’s door. It may take days or even hours for them to succumb to their eternal slumber.